The Pittsburgh metro unemployment rate dropped to 7.9% in November from 8.3% in October, more than 2% below the national November rate of 10.2%. 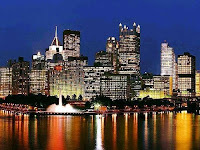 However In November 2008 the Pittsburgh rate was only 5.8%. This was the first month to month decline in two years and the largest month to month decline since 1998. The 7.9% November 2009 rate represents 95,100 unemployed workers out of a labor force of 1,205,200. One year ago the labor force was listed at 1,221,800 with 70,300 unemployed workers. Manufacturing jobs, though still down from October, are stabilizing at fewer than 90,000 for the region. Service related jobs, powered mostly by healthcare and education, showed growth. These numbers are consistent with what we saw in November with help wanted job counts showing slight gains (followed in December by further gains).